Tumor angiogenesis is a multiple step process regulated by a range of pro- and anti-angiogenic factors, cytokines and several signaling cascades, including the ERK1/2 MAP kinase pathway. Galium aparine (GA) is a perennial plant of the family Rubiaceae, growing widespread in Anatolia. It has been shown that GA methanol (MeOH) extract has anti-proliferative and apoptotic effects on human breast cancer cells. To investigate the underlying mechanisms that might account for the anti-proliferative effect of GA extract, changes in angiogenic cytokines and ERK1/2 proteins were investigated in human MCF-7 and MDA-MB-231 breast cancer cells. Viability of breast cancer cells after treatment of GA were determined by Cell Proliferation Kit II. Changes in angiogenic cytokines in breast cancer cells was done by a Human Angiogenesis Antibody Array. Protein levels of phospho ERK1 and 2 were evaluated by western blot analysis. GA induced cytotoxicity and apoptosis in a time- and concentration-dependent manner in both cancer cells. Dipeptidyl peptidase-4 (DPPIV), insulin-like growth factor-binding protein 1 (IBP-1) and transforming growth factor beta 1 (TGF-β1) levels were significantly decreased; however, secretion of serpin E1 was significantly increased by GA extract in MCF-7 cells. In MDA-MB-231 cells, the levels of amphiregulin (AR), interleukin 8 (IL-8), insulin-like growth factor-binding protein 3 (IBP-3), metalloproteinase-8 (MMP-8), heparin-binding EGF-like growth factor (HB-EGF) and platelet-derived growth factor (PDGF) were decreased by GA extract treatment. The secretion of pro-angiogenic cytokines such as neuregulin-1 (NRG1-β1), vascular endothelial growth factor (VEGF) and tissue factor (TF) were significantly decreased by GA treatment in both breast cancer cells. There was also a significant decrease in protein levels of both ERK1 and ERK2 in MCF-7 and MDA-MB-231 breast cancer cells by GA treatment. These data suggest that GA might be a promising candidate for anti-tumor and anti-angiogenic treatment of breast cancer. Kirsch, M.; Schackert, G.; Black, P.M. Metastasis and angiogenesis. Cancer. Treat. Res. 2004; 117, 285-304. ISNAD Atmaca, Harika . "Effects of Galium aparine Extract on the Angiogenic Cytokines and ERK1/2 proteins in Human Breast Cancer Cells". 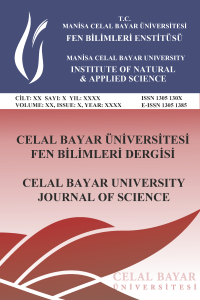 Celal Bayar University Journal of Science 13 / 1 (March 2017): 171-179.